Mormon Wookiee: #48: Linsanity and impossible expectations. I am a huge fan of NBA basketball. In fact, one of the most memorable moments of my life occurred when John Stockton made a 3-pointer over Charles Barkley to send the Utah Jazz to the 1997 NBA finals. It was at that moment that I knew I was DESTINED to play in the NBA someday (unfortunately, it didn't quite work out since I wasn't even the best player on my Ward church ball team). Despite my crushed dream of NBA stardom, I still love to watch the games (and work on my fantasy basketball team on cbssports.com). As you probably know, during the last two weeks one of the biggest stories in the news has been the explosive rise of NBA rookie point guard Jeremy Lin for the New York Knicks. An undrafted player from Harvard University, Lin is the first Taiwanese-American player to ever play in the NBA. On February 4th, Lin made his first career start in a game against the New Jersey Nets, in which he led the Knicks to victory, scoring 25 points! Over the next six games, Lin had additional amazing performances (such as scoring 38 points against the Los Angeles Lakers on February 10th or hitting a game-winning 3-pointer against the Toronto Raptors with less than 1 second remaining in the game on February 14th), leading the Knicks on a 7 game winning streak. 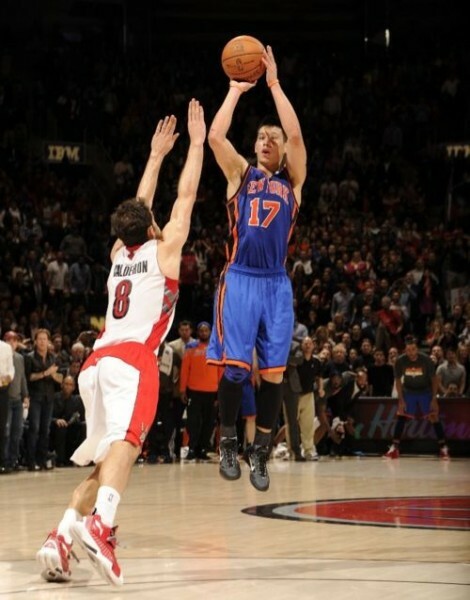 "Linsanity" gripped the nation, and Jeremy Lin was heralded as the greatest rookie to ever play the game. Unfortunately, just a few days later, Lin had a bad game in a loss against the Miami Heat, shooting only 1 for 10 from the field. Suddenly, critics were everywhere, saying how overrated Lin was as a player and that he couldn't lead a team to victory (even though he only had one bad game!). Lin hasn't yet had another chance to prove his doubters wrong, due to the annual All-Star break this weekend, during which no regular season games are played. Lin's game-winning 3-pointer against the Toronto Raptors. As I watched the meteoric rise and sudden fall of Jeremy Lin, it led me to think about the impossible expectations we sometimes place upon our real-world heroes (sports, political, celebrity or otherwise). Just like Tim Tebow in the NFL earlier this year, Jeremy Lin was set up against expectations that no one could sustain forever (and through no fault of his own). Amazingly, Jeremy Lin has stayed extremely grounded and humble during the "Linsanity" of the last few weeks. Lin is an evangelical Christian who lives his faith. After one victory during his remarkable run, Lin said, "I've surrendered that to God. I'm not in a battle with what everybody else thinks anymore." After his basketball career, Lin hopes to become a pastor who can use his influence to work with underprivileged children. We should really admire Jeremy Lin for his faith and desire to help others, not just for just his skills on the basketball court. Additionally, I think we can apply Jeremy Lin's story to our own lives. One of my dad's favorite quotes goes something like this: "The greatest source of frustration is unmet, unrealistic expectations". For members of the Church (and for anyone striving to live a good life), we sometimes set unrealistic expectations for ourselves to be perfect. Then, when we fall short of meeting these expectations, we become discouraged and give up entirely. Perhaps, just as in the case of Jeremy Lin, we need to be more moderate in the expectations we set for both ourselves and others.